Join the many schools around the world that are using Haber as part of their curriculum, as an entertaining and involving starting point for classroom discussions about science, history, and ethics. Read the recent NSTA (National Science Teachers Association) review of the film, read the testimonials below to hear what teachers are saying, or watch the trailer now! 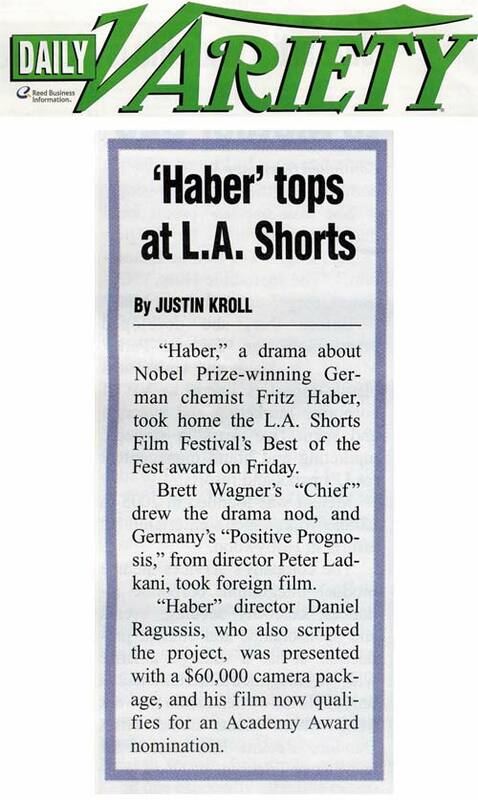 Haber won the Academy Award®-qualifying Best of Fest award at LA Shorts, the largest short film festival in the world, as well as the Grand Prize at the Rhode Island International Film Festival, the Motion Pictures Award from the National Board of Review, and a grant from the Alfred P. Sloan Foundation. It has been featured twice in Chemical & Engineering News, as well as The New York Times, and Daily Variety, and has been presented at the New York Academy of Sciences, the American Chemical Society, and the National Research Council's Committee on Chemical Demilitarization. The Haber DVD is offered at a special Educational rate that includes a license to keep the film in your school's media library, as well as to screen in it educational settings at your school. All proceeds will go toward the development of the feature film, so by teaching your students about Haber, you are also helping his story make it to a movie theater near you! Now available for $29.99 from Amazon.com, for both high schools and universities! "Haber" is a gripping, moving and provocative exploration into the human side of the man who changed the world forever. The film evokes student discussion of the interplay between science, society and human nature. And it portrays vividly that science, at its core, is very much a human endeavor. 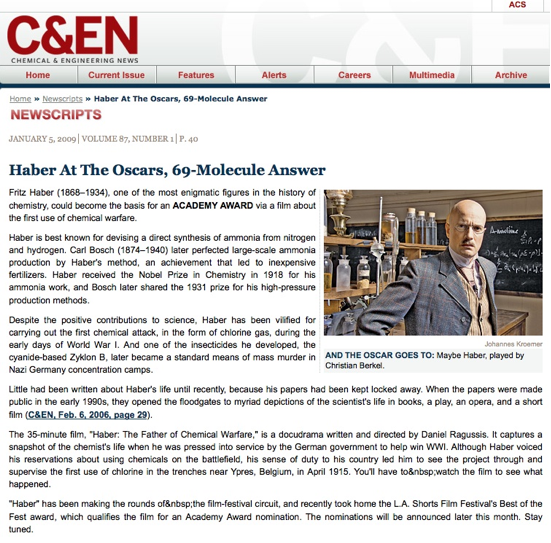 I showed the film Haber to my AP Chemistry students after we studied the Haber process. They were thoroughly engaged by the film and wanted to know more about Dr. Haber after watching it. The film generated conversations about the role of science in the military, the responsibility of scientists to humankind and the nature of scientific achievement, both its benefits and its tolls on humanity. The students found the complex character of Haber's wife, Clara, equally as interesting. I will continue to show this excellent film to all of my chemistry classes in the years to come. 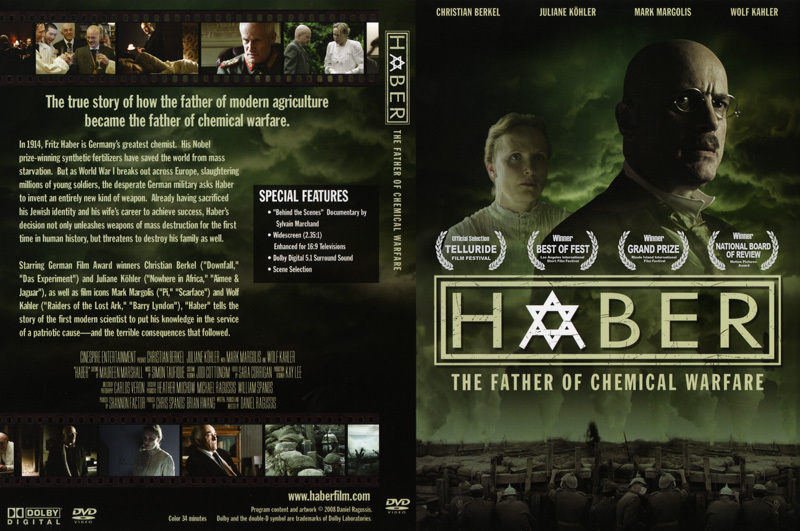 The Department of Chemistry and Biochemistry at Calvin College showed the film "Haber: The Father of Chemical Warfare" during our weekly departmental seminar (fifty minutes). We found the film a refreshing change from our normal routine of presentations on current research topics. The short length of the film (~30 minutes) allowed time for discussion after the showing. Student and faculty response was very positive. The film was an excellent addition to my course. Haber's personality really comes through in the film. Perhaps most poignant was the portrayal of Haber's wife Clara. The settings in the film give a real sense of place and time--students found the film haunting. The Haber film is an excellent companion piece to recent documentaries on Oppenheimer and students were able to compare and contrast the two scientists and their roles in different world wars. I was most impressed with the quality of the film and the sensitivity it showed towards the subject matter, the complexity of Clara's character--and of Fritz's--and of their relation to each other. My interest is in part because I come from Berlin, my father was a judge there, the family is of fully Jewish background. We were fortunate all to get out of Germany in time. I negotiated with Stoltzenberg and helped convince him to let CHF publish an English version of his Haber biography and I was partially involved in the translation process. The film "Haber" was really interesting for me and also for my classmates, we really enjoyed it and had good discussions about the behaviour of Haber and also Clara Immerwahr. We were in year 12 and I would recommend the film for students over 16. My working experience on the film was quite succesful. Although the film was in English it was easy to understand and the actors were great! My teacher was also fascinated and she wanted to show it to other students as well. I think this film is an enrichment for this topic in class. "A great dramatization of the real life events that allowed a deeper insight into events surrounding the development of the Haber Process"..."Much more interesting than a text book"..."A very educational and well made film"..."Superb!"